If you are yearning to own a piece of fire pit that serves as a good furnishing in your backyard and serves its main purpose then the Landmann Big Sky Stars and Moons Fire Pit in Georgia Clay finish is just the one you are looking for. With its astonishing finish and sweet cut-out design of stars and moon, it will surely bring a good atmosphere as you relax and unwind in your yard or patio. 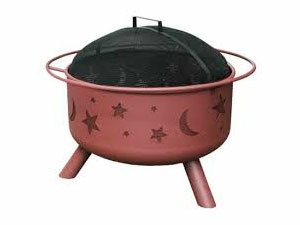 On the other hand, this model of fire pit comes with amazing features which are versatile and flexible. It comes with a 23.5 inch-diameter bowl and a safety ring in full-diameter that provides a space for footrest and expedient handling. The package includes a full-size cooking grate and a spark-guard cover for protection. The design is compact and portable with an estimated weight of 50 pounds. You can easily transport and store this item without any hassle because it is light weight and you will be guaranteed with its stability and good quality. The design of this model is simply beautiful both externally and internally. It is also sturdy and strong especially that it is made from high quality steel. The big surface area for cooking and grilling allows heat to flow around it evenly. The protective screen is also effective in protecting the user from fire sprinkles which is a good safety feature. Although this fire pit is frequently used but it still works very fine just like brand new. The food is also found to be well-grilled with its natural flavors preserved. After use, cleaning the whole thing is just so convenient since it is very easy to maintain and both assembling and dismantling the whole piece is not complicated at all. There are some features in this model that were found to be not working well. One is the ring that was observed to be not working well. The screws and its holes are not aligned which is difficult to assemble and eats a lot of time. The paint also started to peel after months of use and even worse some rusts were observed at the bottom of the fire pit and surprisingly also the legs. It might be that this item does not fit to extreme exposure to heat and to wet surroundings as well.